Ladies! 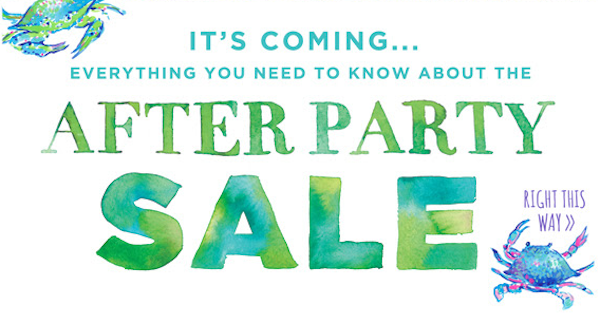 Are you ready for the Lilly Pulitzer - After the Party Sale?! It starts this Monday August 18th at 8am EST! Dang it - that means I have to be up by 5am to shop this sale! But I will be up and I will be ready! 1. Make sure you have an account with Lilly Pulitzer. They give you detailed instructions on how to set up an account and to have it ready for the sale - go read it now. 2. Make a list of the must haves - for me - I have a few items from their Tusk in Sun line - I absolutely love how cute the elephants are so I'll be hunting the last few pieces down. And their Callahan shorts are so comfy - so I'll be stocking up on those as well. 3. Check out as fast as you can because things WILL sell out. This is why you should make sure you have an account set up! Besides, shipping is FREE!